Trying to find the perfect look for Halloween – or want to get a cool outfit for some fun around the house? Take a look at this collection of All Baby and Toddler Costumes to get superheroes, princesses, adorable animals, and lots of other costume styles your little ones are sure to love, no matter what you're up to! A baby’s first costume is an important event, one that will be immortalized in dozens of photos and in everyone’s memories, which is why it’s important to choose an outfit wisely. 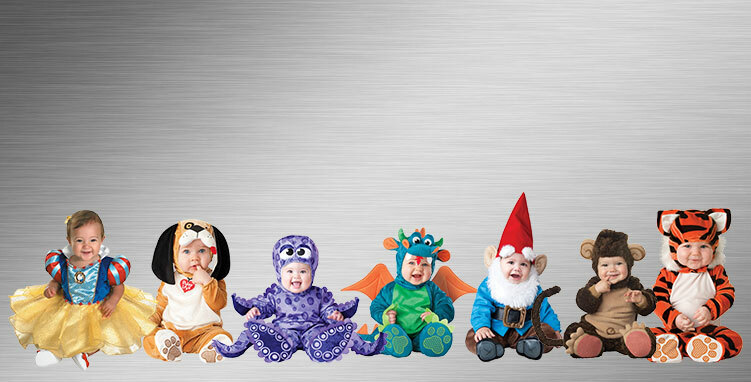 Fortunately, BuyCostumes has a wide variety of baby costumes available so you can pick the one that will showcase your little one’s budding personality and amplify his or her cuteness. Whether your child needs a costume for Halloween, a themed birthday party or other dress-up event, BuyCostumes has you covered. With outfits of adorable animals, Disney princesses, strong superheroes, scary monsters and much more, you can find the perfect look for your little one that friends and family will be admiring for years to come. Uh oh! Party guests will have to be on the lookout for a troublemaker with your baby roaming the party in the Time Out Infant/Toddler Costume. Luckily, the striped jumpsuit will make the mischief-maker easy to spot. After everyone’s captured an adorable picture with the bad boy, send him back to the playpen to serve his time. Your little one will be absolutely irresistible flopping around in this Plush Bunny Infant Costume. The fluffy white suit with a silky pink belly will have people lining up to hold the little furball. Perfect for Easter, Halloween or any costumed event, this bunny outfit will be one to remember. With your baby dressed in the Monster-BOO Frankenstein Infant/Toddler Costume, friends and family will be trembling at the knees from the overload of cuteness. The frighteningly adorable ensemble includes a one-piece jumpsuit with a comfortable hood that features Frankenstein’s trademark bolts, scar and fuzzy, black hair. Even at a young age, it’s clear your little guy has superhuman abilities, or at least a superhuman level of charm and cuteness, which is why the Superman Onesie Infant Costume is the perfect fit. Your little guy can suit up in this adorable onesie and prepare to save the day! Your daughter will capture hearts and make dreams come true wherever she goes dressed in the Disney Tinker Bell Deluxe costume for babies. The sparkly green dress and soft, comfy wings look like they’re right out of Neverland and will work their magic to transform your little girl into a beautiful fairy. Your daughter is bound to be the best dressed in the Disney Red Minnie Mouse Infant Costume. Easy to recognize and universally loved, Minnie Mouse is the perfect costume choice for your sweet, happy little girl to steal the show at the next party or dress-up occasion. Babies and small animals are two of the most adorable creatures on Earth. When combined, the explosion of cuteness is hard to resist. 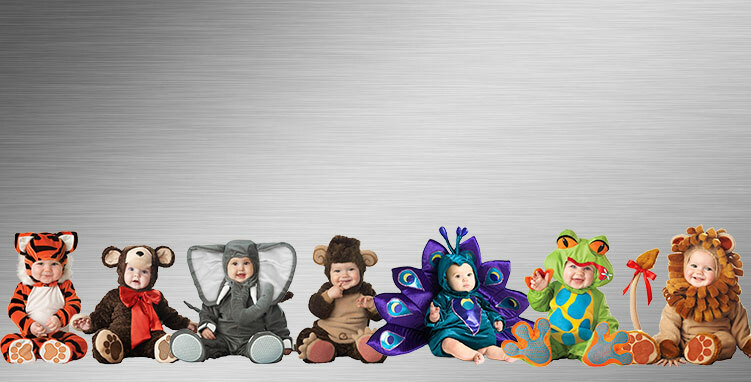 With the large selection of animal baby costumes from BuyCostumes, planning coordinated Baby Zoo costumes for your little ones and their friends won’t be difficult. You can dress your son or daughter in the mighty Lil Lion Elite Collection Infant/Toddler Costume, fierce Tiger Tot Infant/Toddler Costume, stunning Baby Peacock Infant/Toddler Costume, lovable Lil Teddy Bear Elite Collection Infant/Toddler Costume or another favorite from the animal kingdom. No matter which animal costume you choose, your baby is sure to be the center of attention as people flock to the adorable look. Dinosaur costumes are always a hit with the little ones, which is why your baby will be amazing in the T-Rex Infant/Toddler Costume. 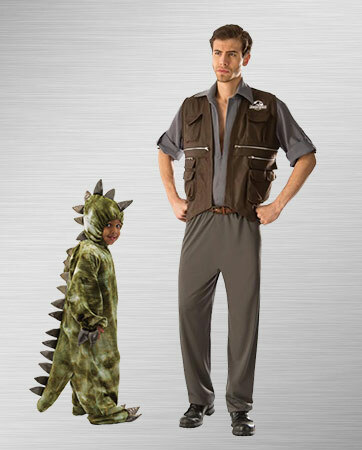 To make his or her costume even more memorable, wear the Jurassic World: Adult Deluxe Owen Costume to match. This Jurassic World duo is sure to be a showstopper at your costume party. Wearing an outfit to match your precious new baby will make her first costume experience truly memorable. 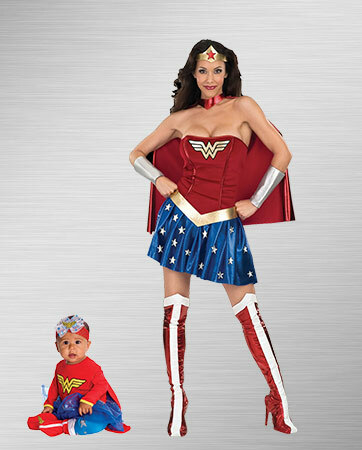 Sport the Wonder Woman Onesie Infant Costume and Wonder Woman Adult Costume at your event to impress friends and family with your extraordinary powers and superhuman adorableness. Winnie the Pooh and Tigger have a timeless friendship and are great costume inspiration for brothers and sisters who are destined to be lifelong friends. 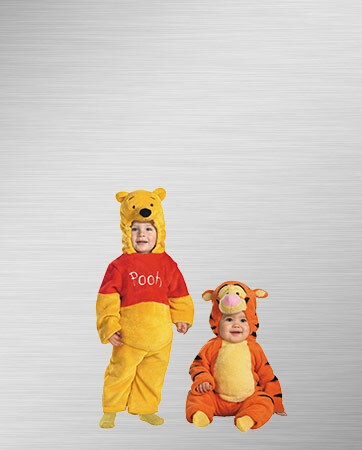 In the Disney Winnie the Pooh Infant/Toddler Costume and Tigger Infant Costume, your little ones will make an unstoppable pair. 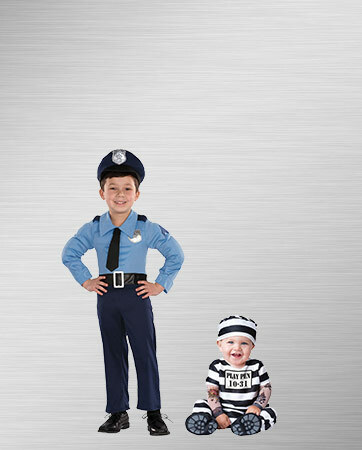 Another excellent pairing for brothers or sisters is the Police Officer Toddler Costume and Time Out Infant/Toddler Costume. With these costumes, the older sibling will fit naturally into the role of police officer as he or she has to keep the younger, troublemaking sibling in line. Your daughter will look radiant as a classic Disney princess on her way to the ball in the Disney Cinderella Infant Costume. However, with just a few accessories, you can make her feel like the real Cinderella. First, add in the Disney Cinderella Child Tiara. The gorgeous piece features a Cinderella cameo surrounded by sheer white organza fabric and lovely blue, white and silver bead work fit for a princess. 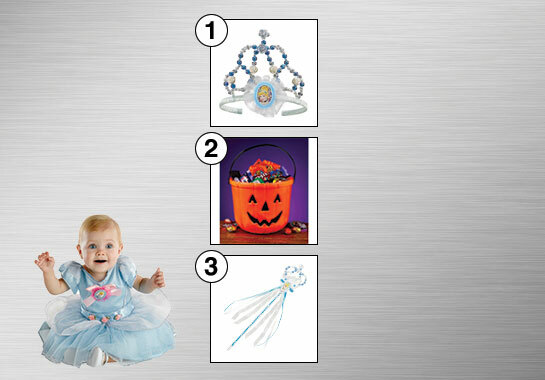 Next, use the Little Pumpkin Infant/Toddler Pacifier as a creative way to incorporate the enchanted pumpkin carriage that took Cinderella to meet her prince. Complete your daughter’s beautiful outfit with the Disney Cinderella Wand. With a flick of the wand and a little bibbidi, bobbidi, boo magic, your little girl can make her dreams come true without the fairy godmother.